On Monday, the UK’s Office of Data and Statistics released a report that found 1.5 million of that nation’s workers are at “high risk” of losing their jobs to automation. “In 2017, out of the 19.9 million jobs analysed in England, 7.4% people were employed in jobs at high risk of automation,” the report notes. Women and part-time workers are most vulnerable. “New technology is going to generate a lot of wealth,” Sharon Graham, the executive officer for Unite with responsibility for automation, said in a statement. “We will fight to make sure this wealth is used to do things that help workers and their families, such as reducing working time without loss of pay. Automation needs to deliver for ordinary people, not just make bigger profits for corporations. The fact that this might scan as a radical proposal just shows how far we’ve drifted from the century-old promise of automation, as articulated by the likes of John Maynard Keynes, who believed machines would deliver us a relative leisure society. It makes perfect sense; if machines are improving productivity to the point that workers aren’t required around the clock, shorten the time on the clock. Share the gains gotten by automation, rather than concentrating them at the top. It’s what a sane society concerned about all of its members would do. Given the corporate dominance over modern economies, achieving that balance, and allowing the middle class to benefit equally from automation, is likely going to require something resembling a political movement, and a strong raft of laws. 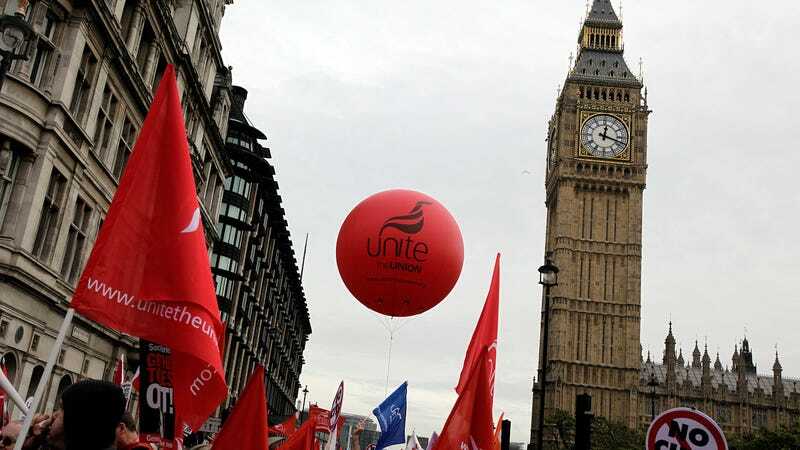 There is noise currently being made about adopting a 4-day working week in the UK, and Unite is furthering that call here. No small thing, given that the union represents 1.2 million workers. “Unite has undertaken an in-depth analysis of the threats automation poses to the 21 sectors of the British and Irish economy where the union is organised,” Graham wrote me. The union has consulted with 3,000 workplace reps across those sectors for input on how to address their automation plans. They’ve ID’d the top 10 employers in each of those sectors, Graham says, as well as the top 10 employers of women and POC workers at risk of both job automation and maltreatment via biased AI systems. Unite will be engaging those top employers to adopt a ‘New Technology Contract,’ which would include the above mentioned policies. “By driving the agreements through the top ten we aim to ‘pull up’ standards across the sectors,” Graham says. Shortening the working week, it seems to me, is a good way to appease both those eager to see technology accelerate improvements in our daily lives, *while* insulating the livelihoods said improved technology is intended to benefit from immediate harm. The movement to link automation directly to less work for the middle class will be an important one to watch.